Chassis engine: Cummins QSX15, six-cylinder, 399 kW (535 hp), torque 1873 ft/lb (1400 rpm). The MEGATRAK™ suspension system is the best off road driveline available on the market today. 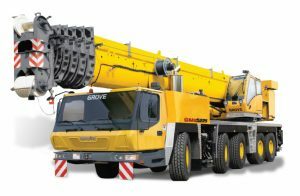 The system’s versatility and performance allows the GMK5225 to operate as a true all-terrain crane. The MEGATRAK™ independent suspension and all-wheel steer system allows wheels to remain on the ground at all times so stresses and weight are not continually transferred between axles. MEGATRAK™ provides true ground clearance where others just raise the chassis. With two engine options, the GMK5225 provides you with the power you need. Drive axles with planetary hub reduction and center mounted differential-gearing. Inter-axle and cross axle differential locks.